beauty products and switch my style everyday; however I've been keeping it back to the basics and these products have definitely been the ones I've reached to most in the recent months. Eve Lom Morning Time Cleanser - This is a cleaner I use every morning (apart from the hectic ones!) which makes the skin really smooth to starts off the day fresh, with my skin feeling good. This you rub into your skin and rinse off; definitely brightening my skin afterwards. I have found since using this my makeup has sat on my skin a lot nicer. This is something I really enjoy using in the mornings. Clarins Radiance-Plus Golden Glow Booster - This Clarins fake tan works miracles, especially during the winter months with no sunshine to get a tan! Every morning I mix three pumps of this into my moisturiser (Simple Day Cream) to apply on my face. This gives a glow that means my face matches my fake tan and makes my makeup look a lot nicer on my skin. However- be aware that when it says wash it off your hands, actually wash it off! I didn't bother the first time and had horrific dark orange fake tan all over my hands for a good couple after I first used it, so defo wash it off -unless you like the orange hand look. This is a product I would highly recommend if you have a pale face, instead of using a foundation which is too dark if you like being more tanned. Bore Charcoal Facial Cleanser - I have been using this cleaner from the start of the year, I've found that it has made a big difference to my skin, making it feel a lot clearer, fresher and healthier. This I use every evening whilst taking my makeup off. The difference I have seen whilst using this have been very good, with less red pigmentation on my face as a result. This is something I am going to continue to use once a day to see how it really changes my skin. Definitely a staple beauty product for me at the moment. Perversion Mascara - This is my current mascara which I got a sample of just before Christmas, and since then have had to go out and get the full size product. This mascara really lengthens your lashes, making them look fuller and look like there are twice as many. This strengthens any makeup look and is one I can see myself using for a long time! Wake Me Up Concealer - This is a concealer I've used for years, like a lot of people. Can't say it's the best or rave about it too much as haven't tried many others! I just know that it has done me very well using it. These concealer last a long time and do not budge from your face once put on, definitely good for those break out days. It does the job and definitely gives the parts of my face that need a little more coverage a little more umph in the colder months. Eyebrow Expert Styling Kit - This is an eyebrow kit I have used for years, and one I always come back to. Using the lighter shade in the middle all over and the waxy part as well on the outer end, making them seem more defined and making sure they stay put all day. No matter the day, whether it be a next to no makeup day or a little more, putting your eyebrows on always makes you look a little more alive and normal - an essential part of my every makeup look. Urban Decay Naken Basics Eyeshadow Palette - I use this palette on the go 90% of the time. With light shades which give your eyes a little more definition than just wearing no eyeshadow, this has all the essential colours that can make a minimal makeup look look well put together and a lot prettier. Using W.O.S all over my lid, then mixing Naked 2 and Faint in the crease depending on the day and how dark I want the look to look. This added with Venus on the brow bone and in the inner corner of your eye for some highlight, as well as Crave put closely alone the lash line smudged out gives a minimal but beautiful makeup look which will look good on anyone with any eye colour. This is a key eyeshadow palette for me which I always find myself coming back to on the more basic days, being one of my staple products. BareMinerals Original Foundation - This foundation powder I have used for years, being one of the first ever makeup products I got my hands on. This powder gives a glow to the skin, making you look bright and fresh faced on those days when your skin is definitely not! This foundation is extremely buildable that I find I use it for trips to the gym when I just need a little more colour; I use the excess on my brush quickly and it makes me look a lot more awake. I also use this (but a lot more of it), for a full faced makeup look when I do not want to wear a liquid foundation. 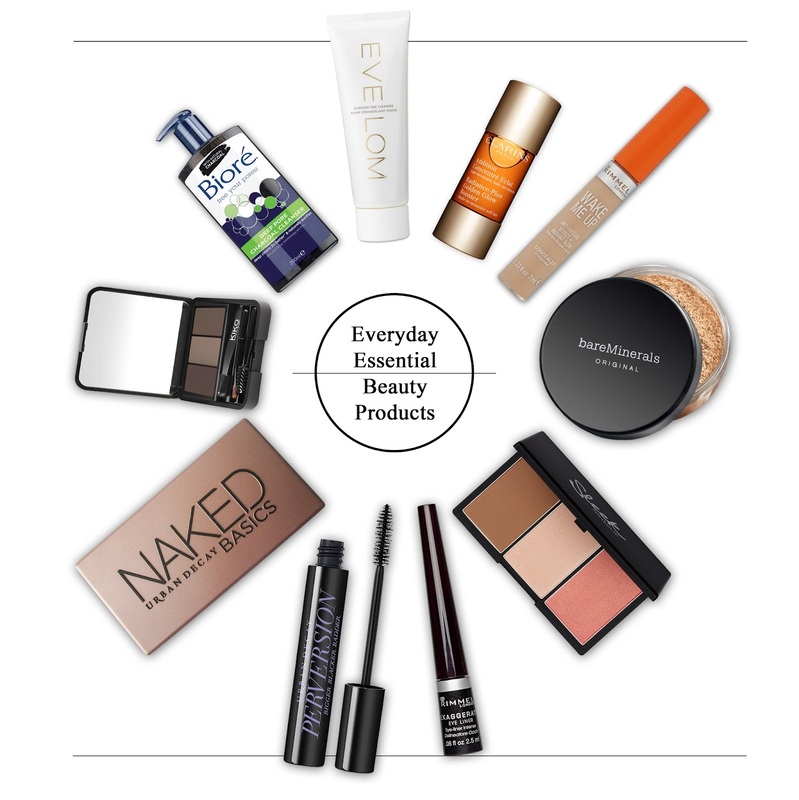 This can be extremely full coverage when you want it to be, it just depends how much you use. I have never found a foundation that gives the same finish as this powder foundation, so is one I always come back to. This is something I think I will carry on using for a long time which is definitely an essential in my makeup bag. Rimmel Exaggerate Liquid Eye Liner - Through trying nearly every highstreet eyeliner, I always come back to this one. This eyeliner is blacker than black and stays on all day beautifully with no shine to it. The intense colour makes your eyes pop out even with no other eye makeup on as is so dark. The only way I could fault this eyeliner is that on those days when you want to do your eyeliner quickly - its not the one. This definitely take time and practice as the eyeliner can be quite runny, however very much worth it. If your looking for an eyeliner that is easy and quick to use i'd use L'oreal Super Liner as is unbelievably quick and easy to apply, just gives a different more glossy finish. Sleek Face Contour Kit - This contour kit I love. With a deep dark contour making your face look a lot more defined and bronzed. The contour in this palette I think is extremely pigmented and works very well on my skin. The highlight in the kit I also love as brightens every look making my face look glowier and brighter as a whole. These are all products I love and would recommend these to anyone. My definite go-tos this winter and ones I could not live without at them moment. Out of these products I only have the urban Decay naked basics palette. It's such a great little palette- really handy for when travelling too. Drink a lot of water before anything else.Claylovers Twilight of rest and not drinking, your body is dried out.